One of my favourite stars is the red supergiant Betelgeuse. It's pronounced "Beetlejuice" just like the movie, in fact the movie's title was originally Betelgeuse and the character's name is spelled that way several times on screen. 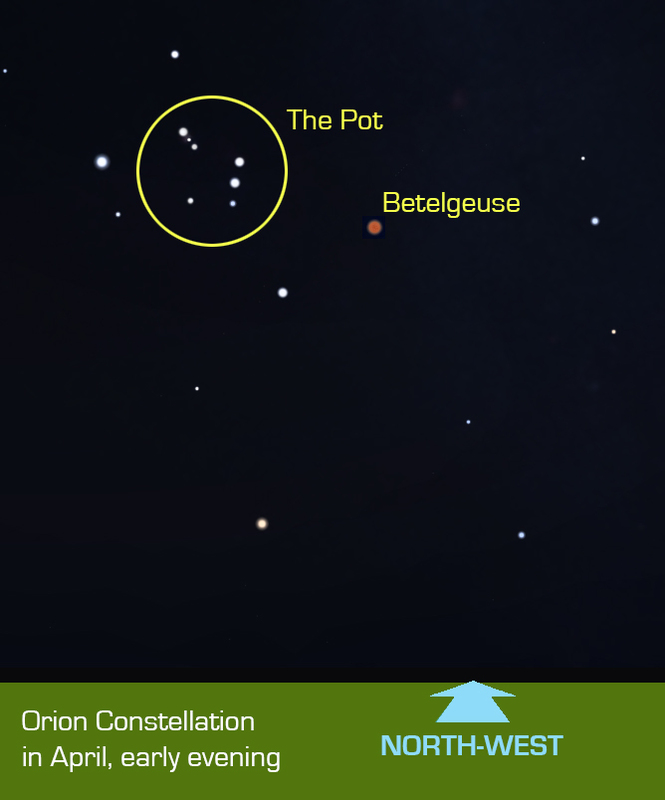 From our point of view Betelgeuse is the second brightest star in the constellation Orion and the ninth-brightest star in the night sky. During April we can see it in the western evening sky. Look for "the pot" and then find the four bright stars that surround it. Betelgeuse is the one that looks noticeably red. Everything about this star is extreme. It's one of the few bright stars that have a distinct colour, in this case caused by its age. Although it's less than 10 million years old which is young in star years, giant stars don't live very long and Betelgeuse is near the end of its short life. It has become red, bloated, and is showing signs of going supernova (exploding). This could happen any time in the next million years. Betelgeuse is over a billion kilometres wide, more than 900 times the size of the Sun. If the Sun was the same size as Betelgeuse it would engulf the planets Mercury, Venus, Earth, Mars, the entire Asteroid belt and possibly even Jupiter. Being so large and relatively close at 640 light-years away, Betelgeuse is one of the few stars that we can actually see as a disc through a telescope (most stars appear as single points of light, even through the Hubble telescope). In 1920 Betelgeuse became the first star after the Sun to have its apparent size measured. Since then astronomers have been recording the star fluctuating greatly in size and brightness (its brightness varies more than any other bright star in the night sky). What will happen to Earth when Betelgeuse explodes? Nothing. It will just look like an extremely bight star and it won't hurt us at all. In fact, despite the many interesting ways the Universe could destroy our planet, supernovas are not a threat. So relax and enjoy the beauty of this majestic star.